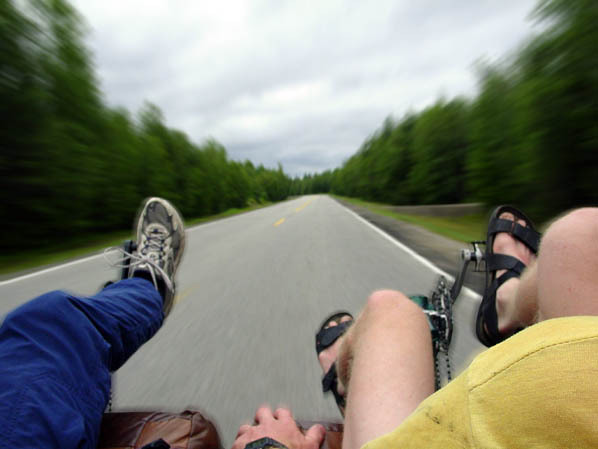 Below is the true story of Brent and Eivind's travels through Maritime Canada on a human powered couch in the summer of 2002. RCMP Constable Kevin Demeau was diplomatic. He readily conceded that he wasn't sure how things worked where we came from. But still, after having spotted my Norwegian cycling partner and I pedaling in the opposite direction down the coastal highway north of Kouchibouguac National Park, a sense of duty had compelled him to turn back and fill us in on how things work in the province of New Brunswick. A quick chirp of his siren and flash of lights had brought us together by the roadside. As storm clouds loomed overhead, he and his partner surveyed our bicycle. Ours was a lot like other tandem bikes one might spot on the roads from time to time. It had two sets of pedals and very long lengths of chain. The frame was welded together and made of light but strong chromoly steel tubing. But what made our bike so special, and also what seemed to be Constable Demeau's chief concern, was the couch. It was an old leatherette loveseat. Our frame was built around it, and Eivind and I were perched on top of it. We sat side by side on the cushions, our legs extended in front to spin the pedals. I steered the bike with a tiller linked to the two front wheels on either side of the couch. Mankind has invested more than four million years of evolution in the attempt to avoid physical exertion. Now a group of backward-thinking atavists mounted on foot-powered pairs of Hula-Hoops would have us pumping our legs, gritting our teeth, and searing our lungs as though we were being chased across the Pleistocene savanna by saber-toothed tigers. Think of the hopes, the dreams, the effort, the brilliance, the pure force of will that, over the eons, has gone into the creation of the Cadillac Coupe de Ville. Bicycle riders would have us throw all this on the ash heap of history.